Helen Sharman, the first Briton in space, celebrated the 25th anniversary of the event this week at Imperial College London, where she now works as Operations Manager in the Department of Chemistry. She also celebrated at the Science Museum. 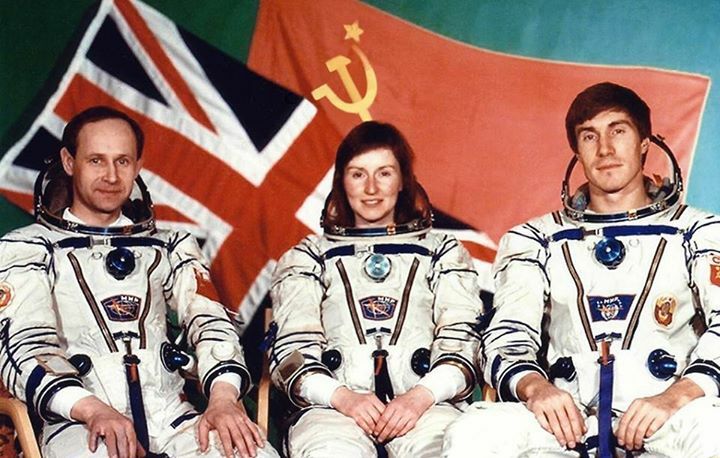 On 18th May 1991, Dr. Sharman, together with Russian cosmonauts Sergei Krikalev and Anatoly Artsebarsky lifted off for the Mir space station on the Soyuz TM-12 mission, which lasted eight days. Dr. Sharman’s tasks included agricultural and medical tests, photographing the British Isles, and taking part in an amateur radio hookup with British schoolchildren. The twenty-fifth anniversary was celebrated with her Russian colleagues as well as about a dozen astronauts. Earlier this week, on 18th May, she was reunited with the spacesuit she wore in 1991. The suit is on display at the Science Museum in South Kensington, London, where it is usually behind a glass case. Dr. Sharman had to wear gloves when she touched the suit – in order to preserve it. On 20th May, Dr. Sharman returned to the Science Museum to commemorate the day she and her crew members docked with Mir. Astronauts and cosmonauts generally celebrate ‘docking day’. Other European astronauts as well as her original Soviet crew from her missions joined her in the celebration. Sergei Krikalev holds the record for the second-longest time spent non-stop in space – 803 days. Krikalev was one of the people who helped train British astronaut Tim Peake, who is currently aboard the International Space Station. The astronauts enjoyed a projection at Imperial’s Data Science Institute, which took them on a quick simulated trip to Mars. Before Major Peake was launched to the International Space Station (ISS) last December, he asked Dr. Harman if there was anything she would like him to take. She gave him her copy of Road to the Stars by Yuri Gagarin, the first human ever to go into space. She had taken Gagarin’s book into orbit with her in 1991, so the current ISS crew could add their signatures alongside her Mir crew mates. In May 1991, exactly twenty-five years ago, Helen Sharman became the first Briton in space.